The Embrunman Triathlon is held in mid-August in Hautes-Alps in France. It is considered by many as France’s most difficult triathlon. The cycling course comes with 186 km of challenging mountain terrain. The multi-day event started in 1984 and became a long-distance triathlon a few years later. The event is among the world’s toughest. It starts early in the morning with a 3.8km lake swim and is swiftly followed by the challenging cycling stage of 186 km through the Alps before finishing with a 42-kilometer run. The bike course has more than 10,000 feet of climbing at a maximum elevation of 7,700 feet, meaning you will be dealing with both heavy climbing and altitude. Held in the scenic scenes of Scotland`s highlands, the Celtman Extreme Triathlon is part of the Xtri family, which includes other standout extreme races like the Swissman and Norseman, which are becoming increasingly more popular. The cycling stage takes athletes 202km through the Scottish highlands, representing one of the most demanding stages in any triathlon. With more than 6,500 feet of climbing, along with heavy winds, rain and low visibility, it is a bike course not meant for the faint of heart. There is a 2km climbing stage, but the whole cycling leg is affected by the fast-changing weather conditions. The event is classified in the “extreme” category due to its demanding conditions and only takes a limited number of participants. Starting in 2012 and taking place in mid-June, it should be said that among the many rules of the event, the triathlete has to be accompanied by another person who can be a friend or supporter. Popular due to its difficulty and exotic location on the Canary Islands, IRONMAN Lanzarote is among the toughest in the world. The triathlon celebrated its 25th anniversary this year, and takes place every year in May. The cycling stage comes with a whopping 180km length and takes triathletes through the volcanic mountains of Montana del Fuego on the Spanish island of Lanzarote. Triathletes can expect a cycling stage with challenging weather conditions including high winds and summer heat. The steep climbs bring athletes to the most northern point for spectacular views of the ocean and surrounding islands. The top 40 participants will qualify for the IRONMAN World Championship, giving an extra incentive to give it your all on this challenging course. The Isklar Norseman Xtreme Triathlon, part of the same family as the Celtman, takes place every year in Norway. The race is popular due to its difficulty and impressive scenery in the fjords. The demanding cycling stage has a total length of 180km. The triathletes will have to climb for the first 25 miles from sea level to an elevation of 3,000 feet. All of this happens after a challenging and cold fjord swim and before a rocky marathon up a mountain. As the race doesn’t offer any support, all triathletes need to have an accompanying team. Needless to say, the health checks are made in detail every year and people not up to standard are prevented from finishing the race. Taking place in the iconic Lake District of the United Kingdom, the Triathlon X has been considered among the most difficult races of its type in the world. The demanding cycling stage has a total length of 181km with an elevation gain of more than 12,000 feet. The cycling route has already become legendary due to the Fred Whitton cyclo-sportive route nickname. This cycling route takes triathletes through some of the most iconic regions of the Lake District. The amazing race has been won with a final time of just below 13 hours for men and 17 hours for women. 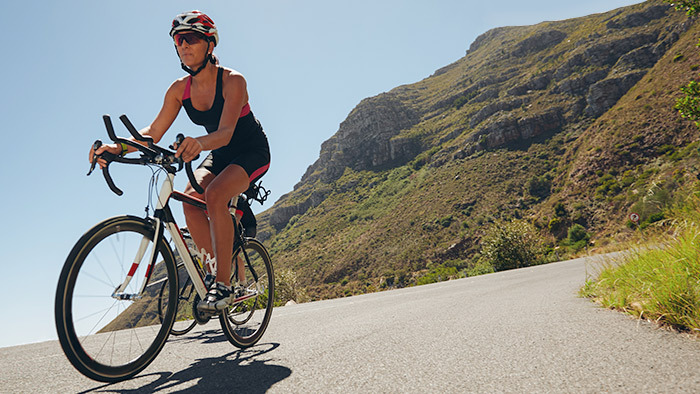 All of the above triathlons offer a mix of challenges for the bicycle courses. Some offer difficult terrain conditions which can be experienced in the Alps with the Embrunman. Other triathlons take participants to windy places with high temperatures, such as the IRONMAN Lanzarote. Other challenging bicycle courses involve considerable elevation gains, such as the Triathlon X Lake District. At some point, all of the above triathlons have been named as the most difficult in their cycling stages, but they can become truly challenging when preceded by demanding swimming stages, as is the case with the Norseman Xtreme Triathlon. The key with any of these challenging bike courses is the right plan, the right coach and the right workouts to prepare you for the hills.